This is the beach hotel of your dreams in Protaras, Cyprus. Constantinos the Great Beach Hotel is an exclusive hotel, with a warm welcoming atmosphere. Constantinos the Great Beach Hotel impressively overlooks the endless shades of blue stretching toward the horizon and is directly located on Protaras sandy beach can offer you a walking dream. The stylish accommodation, elegant atrium lobby, and excellent service complement, the wide range of activities and facilities, which make it the perfect choice for both families and couples who seek relaxation and fun in Protaras area. Enjoy from your balcony the first sunrise in Europe arising from the soundings of Middle East, the panoramic view of the turquoise Mediterranean Sea and the glorious golden sandy beach of Protaras Beach. 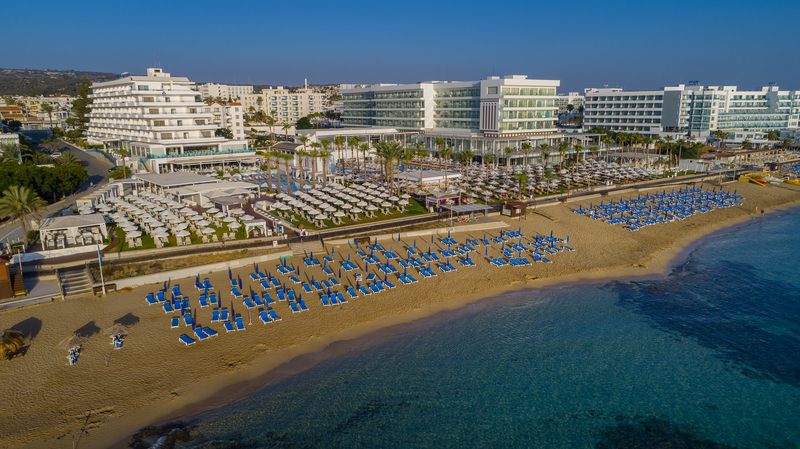 The quality accommodation, friendly staff, and relaxed ambiance make Constantinos the Great Beach Hotel an all-round appeal for a perfect luxurious beach hotel in Protaras Cyprus. Moreover, the large free lagoon shaped swimming pool with its surrounding exotic palm trees and grass, provides a very relaxing atmosphere under the tropical Cyprus weather. Constantinos the Great Beach Hotel is the perfect choice from a variety of beach hotels in Protaras which located right on the beach. It is very close to the picturesque rocky Capo Greco, where the deep turquoise waters are famous amongst scuba divers. Its excellent location near the golden sand, in the heart of Protaras centre offers a wide choice of daily and night activities. Just a short walk will allow you to enjoy the full centre of Protaras with a wide selection of shops, pubs and restaurants. If you are looking for a luxury beach hotel in Protaras, Cyprus offering views across the Protaras bay while dining Constantinos the Great Beach Hotel the ideal choice for you. Charismatic, homely our stunning new Constantinos The Great 5* hotel has been totally refurbished during the winter months of 2017. Offering sumptuous suites, relaxing rooms The Constantinos is in a world of its own. Located on the beach front of the golden sands of Protaras, The Constantinos The Great is in a pristine position for accessibility. Offering breath taking views the hotel is outstanding in all ways. Our brand-new wedding venue White Palms offers crystal clear turquoise waters with palm trees as the perfect backdrop to any wedding photographs. With privacy in mind the Directors, Management and all heads of departments have constructed a stunning venue to melt the hearts of all couples. Fresh and intimate our wedding venue White Palms can offer the perfect location to become husband and wife. The staff within the Constantinos The Great are very friendly, offering a warm and inviting ambience for any wedding within the Constantinos The Great.